We appreciate our involved parents and community members and enjoy broadcasting our latest news and information to you. 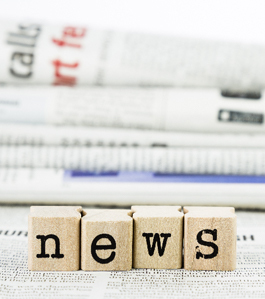 Here on our News page, we’ll chronicle school activities, student achievements, and public announcements. We’ll also offer helpful resources and information. So check back often; we’ll update it regularly. 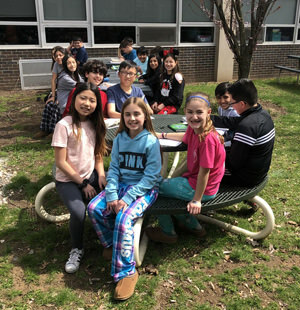 Ms. Pallotto's fifth-graders recently got to spend time outside in the courtyard, during academic support, for their continuous class read-a-loud! What a great way to end the day and start of spring break! 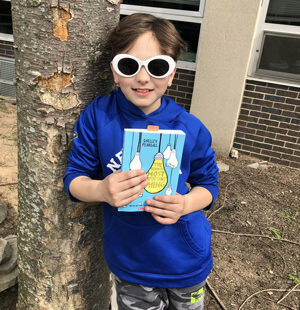 They’ve been reading and discussing The Seventh Most Important Things, by Shelley Pearsall, and loving it. On Tuesday, April 9, the Region I Orchestra Festival was at East Brook Middle School. Orchestras from five different school districts in Bergen County came together to perform for each other and received feedback from guest clinicians Mr. David Wroe and Mrs. Helen Cha-Pyo. Congratulations to each orchestra for their performance and participation in the festival! Thanks to the East Brook PTA for bringing in wolfdogs from Howling Woods Farm. 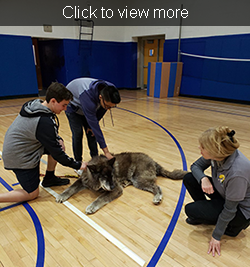 The students got a unique chance to learn about wolves up close. Howling Woods Farm rescues and places domestic bred wolfdogs and northern breeds. They also provide education to the general public about wolves and wolfdogs. Ewing, NJ. – On Friday, March 22, 2019, NJSCA honored school counselors from the different counties within the state of New Jersey at the annual “Counselor of the County” Awards Program held at The College of New Jersey. School counselors get nominated by their colleagues and chosen by their own county’s School Counselor Associations for this award. The award honors the professionals who devote their careers to serving as advocates – and often lifesavers – for the nation’s students. 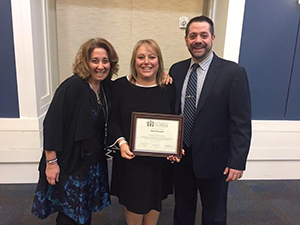 Dana Folcarelli, a school counselor from East Brook Middle School, is the 2018–2019 Counselor of the County for Bergen County. Candidate selection for the Counselor of the County Award happens at their county-level school counselor associations. 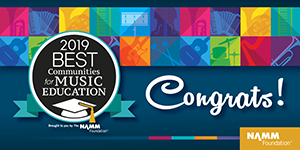 Their selection is because of their ability to deliver an effective school counseling program, which focuses on academic development, career counseling, and personal/social support. 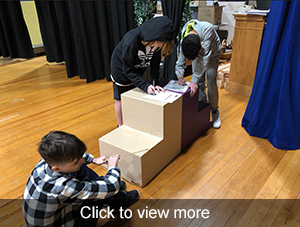 They further distinguish themselves by proving to be leaders of systemic change, advocates for students, and collaborative professionals who seek the success of the “whole” student in school and in life. For more specific information on this association, visit the New Jersey Counselor Association website. Congratulations Dana, we are so proud! Pictured here is Dana with Tommy LoBue, Principal of East Brook Middle School and Counselor Laurie Corizzo. 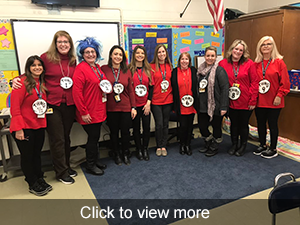 In honor of Dr. Seuss and Read Across America week, East Brook students and staff celebrated in many ways. They wore crazy socks and wacky outfits! Visiting readers came to the classrooms to read their favorite stories, teachers shared their memories of learning to read, and students read to themselves and each other. Check out our awesome photos! Don’t miss a thing! Follow our District’s news feed.